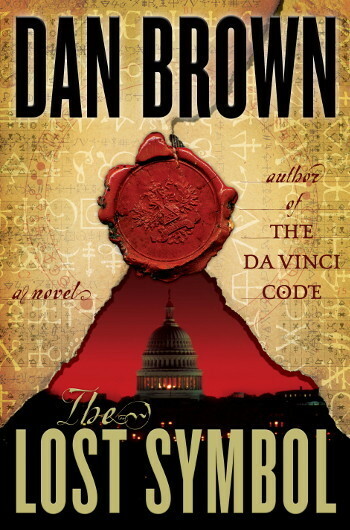 The Lost Symbol, published in 2009 and provisionally known as The Solomon Key, is the third entry in Dan Brown's novel series starring Harvard symbologist Robert Langdon. This time, the story explores the mysteries of the Freemasons and is set in Washington D.C.. Langdon is invited to D.C. by an old friend and mentor (and also not-so-secretly a top-rung Mason), only to discover that he has been an Unwitting Pawn, manipulated by what seems to be a raving lunatic who kidnapped said mentor and now blackmails Langdon into solving the Freemasons' puzzles for him. The final prize in the game is the fabled treasure of Ancient Mysteries, which, Langdon insists, is immaterial but he doesn't have much choice. As if that wasn't complicated enough, the CIA shows up and demands the very same things of Langdon... except that they couldn't care less about his mentor's safety. A movie was announced as a sequel to Angels & Demons, but was scrapped in favour of an adaptation of Inferno. A God Am I: Mal'akh believes this fervently. An Offer You Can't Refuse: Mal'akh needs Langdon's skills so he takes Peter hostage. Ancient Conspiracy: The book, and by extension Langdon, go through great lengths to disprove many common misconceptions and conspiracies about Freemasons. Ancient Tradition: The Freemasons. And no, there is no Ancient Conspiracy here, neither imaginary nor real. Arbitrary Skepticism: Considering his previous two adventures, Langdon is really the last person in the world who should find it hard to believe that an ancient society is protecting a dangerous and powerful secret with hidden codes. Ascend to a Higher Plane of Existence: The Big Bad's master plan is to sacrifice his body so he can ascend and lead the Forces of Evil in destroying mankind. Since Dan Brown's previous novels have generally taken place in "the real world" (ancient conspiracies and shoddy historical accuracy aside), you'd normally wouldn't count on it, except this novel throws in all that stuff about mental energies and the Noosphere being real. As You Know: Practically Langdon's catchphrase. Badass Bookworm: Langdon. Lampshaded when a security guard takes one look at Langdon and wonders how he managed elude to the French police in loafers. The Beautiful Elite: Deconstructed. While Katherine is good-looking and leads a highly privileged life, she has to face several tragedies, including the death of her father in her childhood, the murder of her mother during Christmas time, and the ordeal involving her brother, Peter, that is the subject of this story. Brother-Sister Team: Peter and Katherine, in a way. Calling the Old Man Out: Zachary does this to Peter when he reveals his true identity. CIA Evil, FBI Good: Except that the FBI never shows up at all. And the CIA is revealed to be not that bad themselves. Continuity Nod: There are several references to Langdon's past adventures in the previous books. Claustrophobia: Langdon's fear of confined spaces is abused by the villain for an ingenious torture method. Dan Browned (of course): So, so much. Try the confusion between the meninges and the brain itself late in the book, for one. Deadpan Snarker: Most characters, but Inoue Sato, Robert Langdon himself, Katherine Solomon, and Mal'akh particularly qualify. Depraved Bisexual: While depraved asexual at the time of the story, a throwaway line mentions that Mal'akh used to occasionally enjoy the company of young men in addition to women. Pretty much a classic example of this trope, as making Mal'akh bi doesn't serve any purpose other than to make him even "stranger". Disproportionate Retribution: Zachary's Calling the Old Man Out moment at the end turns everything he's done to Peter into this; Zachary's horrendous decision-making shamed his family and he squandered most of his wealth until he landed in prison, but apparently he turned to all of this because a.) his father refused to bribe a warden to get him released early to teach Zachary the meaning of responsibility, a lesson he badly needed, b.) Zachary changed his mind about the short-sighted decision between wealth or wisdom he made as a young man, and c.) the fact that Peter did not recognize Zachary, after Zachary had taken steroids, shaved his head, gotten tattoos, etc, etc. Zachary's first beef was his having to decide between A. a pot of money right there and then, and B. the wisdom of the ancients revealed several years down the road plus that pot of money complete with interest, which included his dad's Good Ole Boy Network Approval, in whatever he planned to do. Zach grudgingly admits he hadn't thought things through at the time. Eureka Moment: Quite a few. Flashback: There's at least one every other chapter. Gentleman and a Scholar: Peter Solomon. Gender-Neutral Writing: Used to conceal the fact that Sato is actually a woman. Girl Of The Novel: Notably averted, as the lead female character, Katherine Solomon, is fifty (making her closer to Langdon's age unlike the previous books) and her relationship with Langdon is a long-standing friendship. But she's still attractive. I Have Your Wife: In this case, "I have your best friend/brother." Idiot Ball: It's been passed around a few times. It's a Small Net After All: Averted. In order to find what she's looking for on the net, Katherine's assistant has to write a program that hijacks other peoples' search engines and has them work together through parallel processing. After that, she still has to sort out the junk from the useful stuff. Knight of Cerebus: Mal'akh stands out among villains in Dan Brown books, in that he is the first to be both the killer and the mastermind of events. Lampshade Hanging: When Langdon's editor finds out where he is, his reaction is along the lines of "Oh god, not AGAIN". Luke, You Are My Father: It's revealed that the main antagonist is actually Peter Solomon's son Zachary. Mad Lib Thriller Title: The Solomon Key. My God, What Have I Done? : Bellamy when he realizes what Sato really wants. Names to Run Away from Really Fast: The Big Bad has these. Namely, Mal'akh is a corrupted form of the name Moloch. Also Dr. Abaddon, who happens to be the bad guy's psychiatrist alter ego. Oh, Crap! : Mal'akh's reaction once he crosses over. Only a Flesh Wound: After being rescued from imprisonment and torture, including having his hand forcibly amputated, kidnap victim Peter Solomon does not go into shock or collapse from loss of blood, but instead indulges in a bit of light sightseeing and the delivery of several pages' worth of exposition. Robert has to outright ask him to go to a doctor as a favour. Police are Useless: Zigzagged. As was the case in The Da Vinci Code Landon can't count on them because they think he's behind it. However, they are quite useful in disrupting Mal'akh's transmission. Red Herring: That mysterious redacted document that Katherine finds turns out to be a CIA forum discussion about the meaning of Kryptos' true meaning, which happened to contain the exact same keywords she was looking for. Remember the New Guy? : The previous books mentioned not a word about Solomon. All of a sudden, he shows up and everyone has to suppose he is Langdon's father-mentor. Samus Is a Girl: Inoue Sato. Self-Deprecation: The last plot twist in Digital Fortress is reused, and Langdon notes that he read about it in a "mediocre thriller". Straw Feminist: A light version in the form of a student who complains about the lack of women in the Freemasons. Take Over the World: After acquiring the Lost Symbol and becoming a god in Hell, this is what Mal'akh intends to do. Tattooed Crook: "Crook" is a colossal understatement, but Mal'akh is completely covered with them. He is called "a demon" by a man who sees him naked. Two First Names: Inverted. Both "Inoue" and "Sato" are popular Japanese surnames which are very, very, rarely used as first names, so yes, Inoue Sato has a name composed by two surnames. The concept would sound much less unusual in United States, however, due to the old American habit of using common last names as first names. Unsettling Gender Reveal: Inverted again; Langdon doesn't realize Sato is a woman until they meet face to face, and she demands that he stop calling her "sir." Water Torture: The villain tortures Langdon into solving the last puzzle for him by placing him in a coffin and slowly filling it with water. This is especially bad for Langdon, since he also has severe claustrophobia.